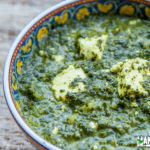 Palak paneer is one of North India’s most popular dish, well for that matter anything that has paneer in it is a hit in India. 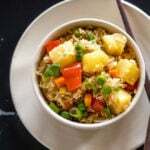 If you go to Indian restaurants you will probably find 3-4 varieties of paneer on the menu, without doubt paneer is India’s most fancy ‘vegetable’. 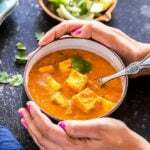 Paneer is cottage cheese which is made by curdling the milk, draining the liquid and then letting the cheese set by putting weight on it for 3-4 hours. Earlier I used to get it from the India store but now I make it at home – it’s soft, fresh and organic! I do not get organic paneer here and so when I make my own using organic milk, my paneer obviously becomes organic too. I am never going back to that frozen packet at the Indian store. 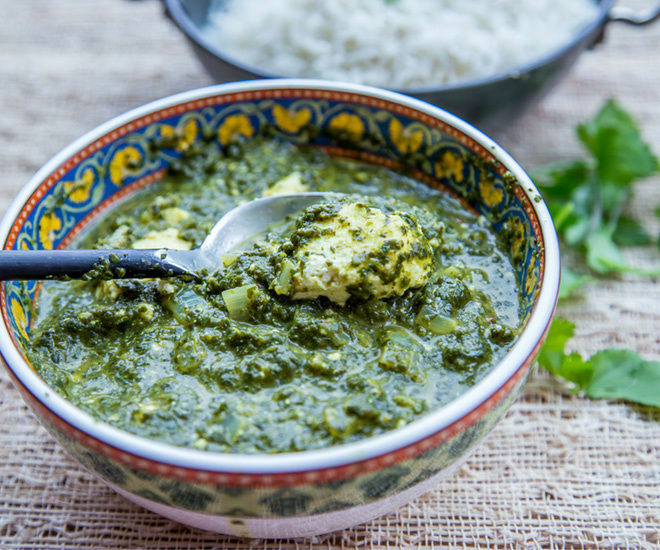 In palak paneer, spinach or palak as it’s called in Hindi is blanched and pureed. It’s then cooked with spices and simmered on low heat with paneer. Cream is added to cut down on the bitterness of the spinach leaves but you can also use milk or yogurt instead. No harm in cutting down the calories right? Everyone has their own way of making this dish and frankly I also make it in a different way every time I cook it. I have this bad habit of always trying to cook the same dish in 10 different ways. This particular recipe is very simple, I hardly used any spices but the next time I make palak paneer it might not be like this at all. In this recipe I have used lot of garlic because I love it’s flavor with spinach but if you aren’t a garlic fan you can cut down on it accordingly. Also using tomatoes is optional, it doesn’t really make or break this dish. I have often made palak paneer with only onions and it comes out great. 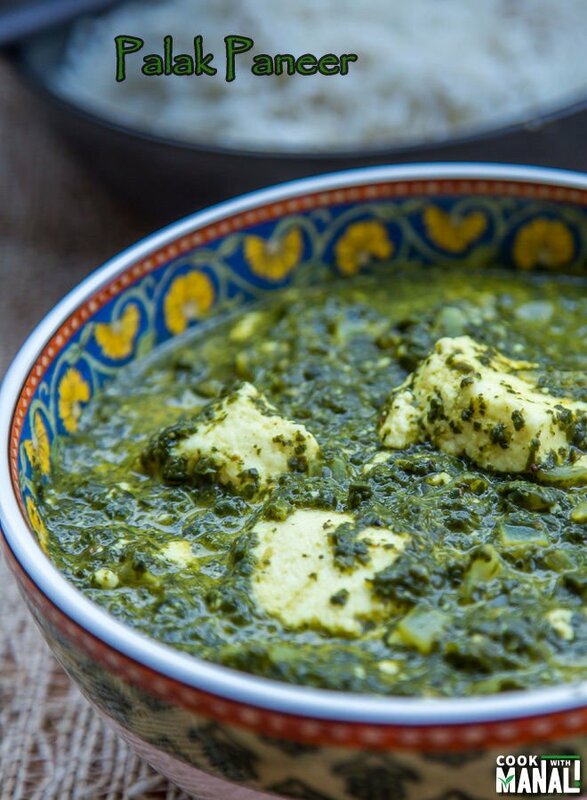 This is a simple homemade and healthy palak paneer recipe, nothing fancy about it. Enjoy it with naan, roti or plain rice. Blanch the spinach leaves by putting them in boiling water with little salt for 2-3 minutes. Take them out and put them in cold water so that the leaves retain their green color. Puree the spinach leaves in a blender along with tomato, 3 cloves of garlic, ginger and green chili. Set aside. You can add some water too while blending. I didn’t add any water. In a wok/pan, heat oil on medium heat. Once the oil is hot, add the remaining 2 cloves of chopped garlic and saute for few minutes until it starts turning golden brown in color. Then add the chopped onions. Fry the onions until translucent and the raw smell goes away. Add in the spinach paste and mix. Add water according to how thick or thin you want the sauce to be. I added around 1/2 cup water at the point. Cover the pan and cook the spinach puree for 10 minutes on medium flame [the spinach will bubble a lot]. Stir at regular intervals to avoid sticking at the bottom. Once the spinach is cooked, add garam masala, turmeric powder, red chilli powder and salt. Mix and cook for 1 minute. Then add the heavy cream and mix. You may use use milk or yogurt in place of cream if you like. And then add the paneer and mix. Let the curry simmer for 3-4 minutes. Switch off the flame, add lemon juice and kasuri methi [dry fenugreek leaves] and mix. * For a vegan version, use tofu in stead of paneer and skip the cream/milk. * You can add water while pureeing the spinach and blend it to a fine paste. Use strainer to get a smooth paste. * Adjust water in the recipe according to your preference and taste. 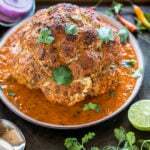 * You can definitely add spices like coriander powder, cumin powder, fennel seeds etc. 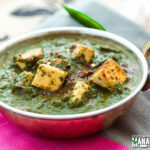 * Paneer pieces can be fried in little oil before adding them to the spinach paste. * If the spinach is too bitter for your taste, you can also add some sugar. 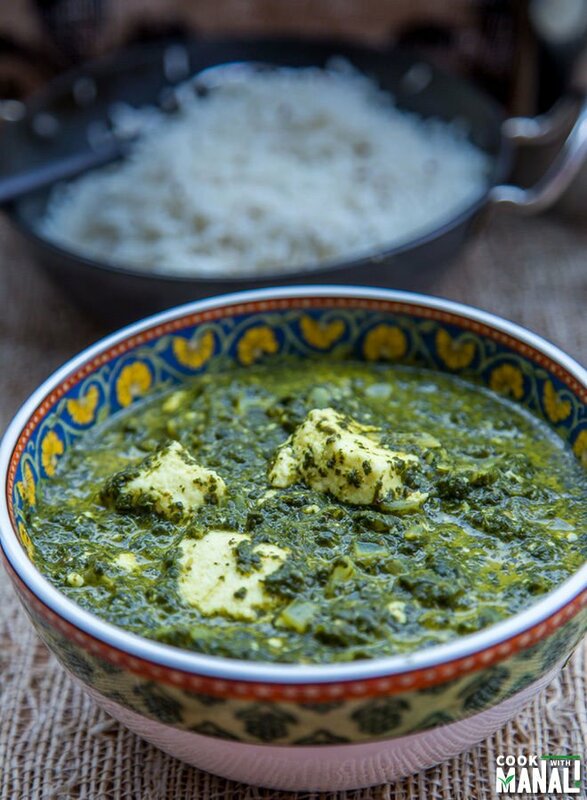 Palak Paneer is a popular Indian vegetarian recipe where Indian cottage cheese is cooked with spinach puree. Delicious & healthy! Blanch the spinach leaves by putting them in boiling water with little salt for 2-3 minutes. Take them out and put them in cold water so that the leaves retain their green color. Puree the spinach leaves in a blender along with tomato, 3 cloves of garlic, ginger and green chili. Set aside. Add in the spinach paste and mix. Add water according to how thick or thin you want the sauce to be. I added around 1/2 cup water at the point. Cover the pan and cook the spinach puree for 10 minutes on medium flame. Stir at regular intervals to avoid sticking at the bottom. Add the heavy cream and paneer and let it simmer for 3-4 minutes. You may also use milk or yogurt in place of cream. Switch off the flame. Add lemon juice, kasuri methi and mix. 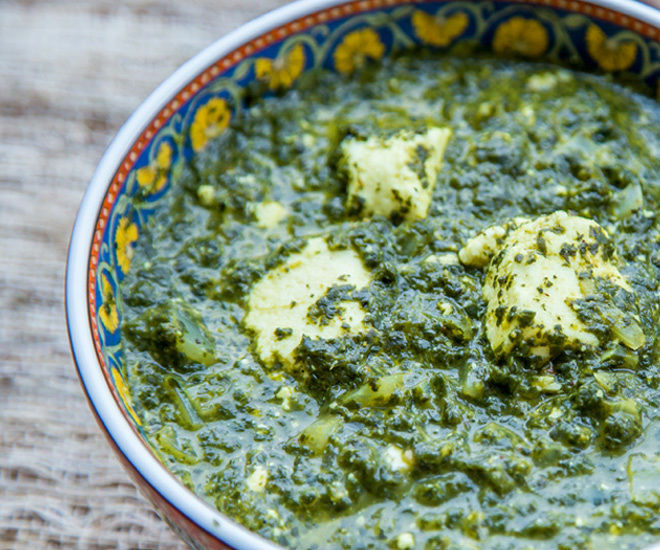 Serve palak paneer hot with naan, roti or rice. Just made the palak paneer for Christmas eve dinner. It was amazing! Thank you Manali!! Glad to hear that Nicole!! 🙂 Merry Christmas! 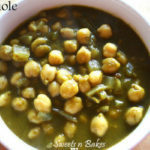 Manali, can I use frozen spinach for this recipe? If each pack of frozen spinach is 1 pound, should I use one pack for this recipe? Thanks for sharing this! My family loved it! My favorite Palak Paneer ever! Thank you for sharing this Manali! Welcome, glad you enjoy it! yes it is but you may add more if you like! 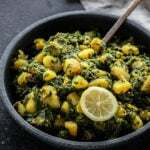 Can I get the recipe for aloo palak with the use of onion, ginger, and garlic? 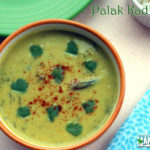 check out this – https://www.cookwithmanali.com/aloo-palak/ it’s like a dry version without the sauce but that’s how it was made in my home 🙂 you can always add ginger to it. Have you ever done this with kale? I plan to try it with lacinato kale but it’s usually much thicker than spinach. No I haven’t made this with kale! Not sure how it would taste with lacinto kale but no harm in giving it a shot! I want to make this recipe for 12 people. Do I x4 of everything or adjust the spices differently? Yes it should be fine! But I won’t recommend doinf 4x spices and liquid. It can be too much, so start with less (maybe triple the spices & liquid) and go from there! I LOVE indian food! Thank you for the recipe! Now I can make my own paneer!!! Followed your recipe to the T and the palak paneer came out excellent! Made this evening for dinner and we loved it. Thanks Manali! Welcome Vani! Glad you liked! You can use pureed onions, just make sure to saute it well until all the raw smell of the onion goes away, this may take 4 to 5 minutes! hope you like it! I tried this! It just came out exactly like Restaurant taste! Just love all your recepies! 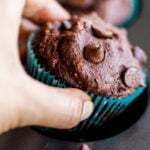 Thanks for posting this awesome and healthy recipie . I tried your recipe 3 times in the last 3 days and it came out great. I have been eating indian food for the past 20 years and have made palak paneer. However making it your style by adding the herbs after the spinach is cooked gave it a restaurant taste!!!! When I sautee the onions, garlic and add spices in (like most avid indian cooks recommend) it rarely comes out the same as the restaurant. With your method, it comes out exactly like the restaurant. Delicious. Thank you so much for sharing. This looks wonderful! Can you please advise what variety of green chili should be used? I’m wondering how far ahead I can make this for a dinner party? Would I make it to a certain point and then finish it later? Thank you for the recipe; it looks delicious! Great recipe, thank you so much! Nutritious and delicious, much healthier and cheaper than restaurants (especially of you make the lanner at home). Just wanted to add that if you use frozen spinach you probably don’t need to blanche because I read that frozen spinach is already blanched before it’s frozen. Also I didn’t have kasuri methi but I added celery seed and it tasted fine. thanks for the tip about frozen spinach, will help those who cook with it..glad you liked it! I meant to say “paneer” in the previous post! I just made a quick version with frozen organic spinach. It was awesome. I can’t wait for my wife to try it! Manali! Thnx for the recipe, DELICIOUS!! Bless and looking forward for more recipies! Awesome! and you are welcome! oh that sounds like a great replacement! glad you enjoyed!